Between convincing television commercials, magazine advertisements, blogs, and listening to our friends, many people are confused about what “healthy food” really is. You may think you’re reaching for a healthy snack, when in reality it’s loaded with sugar, high fructose corn syrup, pesticides and other harmful toxins. Check out these 11 foods you think are healthy, but are actually far from it! You may think munching on fruit and veggies is healthy. But unless your produce is organic, you’re still putting your health at risk. Conventional produce is loaded with toxins, pesticides, chemicals and hazardous GMOs. Foods labeled “low-fat,” “reduced-fat,” and “fat-free” are usually loaded with more sugar, sodium and chemicals to enhance flavor. Pre-made or store-bought smoothies and juices may seem healthy, but they often have more calories than a fast food meal! That’s because they are typically loaded with sugars and syrups to enhance flavor. Many are also made using conventional produce. Instead: Make your own smoothies and juices. Many people turn to frozen yogurt, assuming it’s much healthier than ice cream. You may even think it has probiotics since it’s yogurt. However, through processing, all active cultures are killed. Frozen yogurt is also high in calories and loaded with sugar. That’s not to mention the sugary and fatty toppings people love to load up on! Instead: Eat live cultured, natural yogurt. Also, many wheat products have been treated by pesticides and other chemicals prior to harvest. Instead: Make your own baked goods with these gluten-free flours. You may think you’re doing you body good when you reach for an energy, fiber or protein bar. However, they actually aren’t that different than a candy bar! While meal replacement and snack bars are advertised as “healthy,” they’re actually highly processed, high-calorie, loaded with sugar and contain high fructose corn syrup. Instead: Snack on energy boosting organic fruits and vegetables. You may think opting for a plate full of fish is healthier than a big juicy steak. But if you’re buying farm raised fish, that isn’t the case. Farm raised fish grows up eating genetically modified corn and soy feed. This GMOs feed is nothing like their natural diet. When we ingest farm raised fish, we are also taking a big bite of toxic GMOs. Also, farmed fish have a high risk of disease and parasitic infestation. Lastly, the beneficial protein and omega fatty acids in fish can by reduced by 50% in a farm raised fish. Instead: Eat wild caught fish. Packaged meats are processed and high in sodium. In some brands, one 2-oz. serving contains nearly one-third of the maximum recommended daily sodium intake. Instead: Eat real, hormone-free, antibiotic-free meat. Did you know that this butter alternative is one molecule away from plastic? Highly processed and created in a lab, margarine contains trans fats that are associated with heart disease. Artificial sweeteners trick your body and trigger hunger. The confusing ingredients found in these packages alter the delicate balance of your gut bacteria and allow bad bacteria to take over. For future reference, anything with “artificial” in the name should be avoided like the plague. Instead: Sweeten your food with one of these natural sweeteners. While they’re low-calorie, diet sodas contain artificial sweeteners. 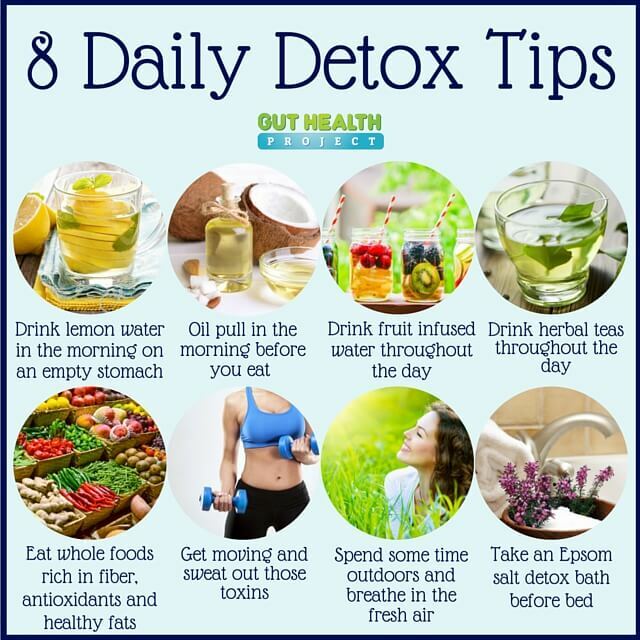 Instead: Drink detox water or unsweetened iced teas. If you eat these foods on a regular basis, chances are you’ve killed some of the good bacteria in your gut. Your body needs that good bacteria in order to function properly. The best way to rebuild you gut’s good bacteria is to consume probiotics! Along with eating probiotic-rich foods (click here for a list of probiotic-rich foods), you should also be taking a daily probiotic supplement. To learn more about how probiotics will rebalance your gut and help cleanse your colon, click here. Click Here To Learn More Before It’s Too Late! Do you suffer from that low energy, groggy feeling no matter how much sleep you get or what you do? Do you have mid-morning or mid-day energy crashes? Do you wish you still had that youthful, vibrant bounce in your step? Believe it or not, probiotics can help! These are all telltale signs your digestive system is stealing your energy! Digestion is one of the largest energy consumers in the body. When your gut is unbalanced, it is harder for you to digest foods causing your body to use more energy in the process. This is one of the top causes of low energy, fatigue and weight gain. When you re-balance and repair your gut by eliminating hard to digest foods (like dairy, gluten and sugar) and taking a high quality probiotic, you will almost instantly see a huge increase in your energy and your health! Do you have advanced for severe digestive issues? Are you struggling with diarrhea, gas, bloating, weight gain, fatigue or leaky gut? This is a sure fire way to know you have an unbalanced gut. Digestive issues tend to occur when your body doesn’t have the right balance of probiotics (good bacteria) it needs to effectively digest and absorb food. If you are struggling with digestive issues like constipation, diarrhea, acid reflex, irritable bowel, or leaky gut, the first thing you should do is take a HIGH quality probiotic. Probiotics reduce your risk of leaky gut syndrome, regulate irritable bowel, eliminate diarrhea, and reduce nearly all digestive related challenges. Plus they can increase your energy and help you regulate your weight. If you have an advanced or severe case of digestive issues, I recommend taking double the daily dose of probiotics for 7-14 days or until your digestive issues subside and your bowel movements stabilize. Do you struggle with dry itchy skin? Or skin conditions like acne, rosacea and eczema? Is your skin aging faster than it should? This is a direct result of an unhealthy, imbalanced gut! Our external environment is a direct reflection of our internal environment. If you struggle with skin conditions, rashes, or dry skin you should pass on the expensive “skin” creams and heal your body from the inside out! Skin problems are a sign of an even bigger health problem brewing in your body. A problem like gut disease…Our skin is our largest organ and it is a direct reflection of how healthy (or unhealthy) our body is. If you want that youthful, healthy glow, start by healing your gut and improving your diet! Drink more water and take a HIGH quality probiotic! Are you getting sick more than you should be? If you struggle with the common cold, allergies or the seasonal flu, this is a sign your immune system is coming unglued! If your immune system is weak, depleted and unhealthy and you’re getting sick more than you should, you’re in danger of developing gut disease and you need to take immediate action steps! 70-80% of your immune system is inside of your gut and your gut bacteria have a direct impact on how strong your immune system is! This means if your gut is unbalanced and unhealthy, your immune system suffers. An unhealthy gut leads to weak immunity causing you to get sick more often! When your gut is balanced, your risk of infection, illness and disease is GREATLY reduced! If you’re experiencing weak immunity, I highly recommend taking immediate action steps to re-balance your gut and heal your digestive system. Did you know studies have now linked an unbalanced gut to anxiety and depression? When our gut is unhealthy, it literally affects every aspect of our body including our mood, mental clarity and ability to focus! If you struggle with anxiety or the feelings of depression, it is highly likely you are also struggling with digestive issues and an unbalanced gut! In studies with both humans and mice, Probiotics decreased anxiety, stabilized mood swings and have a direct result in overall behavior. Taking a high quality probiotic will not only heal your gut, it is clinically proven to positively affect your mood while reducing anxiety and depression. If you take antibiotics, you need probiotics… AND FAST! It may seem counter intuitive that something our doctor prescribes is bad for us, but they can be! The doctor prescribes antibiotics when we have an infection that is out of hand. So we take antibiotics to kill the bad bacteria causing the infection. They are designed to kill the bad, harmful bacteria in our bodies. Which at the time when we are sick, is a VERY good thing! The challenge is, the antibiotics don’t just kill the bad bacteria in your body… they kill the GOOD guys your body needs too! You see, antibiotics cannot determine the difference between the good and the bad bacteria in your body so when you take them, they just kill everything! So taking antibiotics is a double edged sword! They help you feel better in the moment but long-term, they can be devastating to your health! Case in point, your good gut bacteria (probiotics) can be permanently altered after just one cycle of antibiotics. If you have taken even one dose of antibiotics in the last 3-5 years, you NEED to re-balance and restore your gut bacteria immediately! Put an end to embarrassing and equally painful indigestion, i.e. bloating, gas, acid reflux, etc. Revitalize your energy, feel refreshed and recharged–and no more 3 o’clock feeling, ever! Control your weight; drop those stubborn pounds you’ve been trying to lose for years! In fact, many doctors believe probiotics are the most important supplement you can take! Not All Probiotics Are Equal! The only question is, what probiotics should you take? There are TONS of cheap, low quality, ineffective probiotics on the shelves today. Before you run out and buy the first probiotic you see, you must know what to look for and most importantly, what to AVOID! We explain everything you need to know in detail on the next page. Most people are considered overfed and under-nourished. That’s because, throughout the years our eating habits have gotten worse and our stress levels are at an all-time high. This takes a toll on the body in many ways, including our digestion. Poor digestion puts a strain on the intestinal tract, which reduces our body’s ability to absorb nutrients. Unlike raw foods, fresh juice is already broken down, making it easy to digest. Your body doesn’t have to do any work. Instead, fresh juices go directly into your bloodstream. 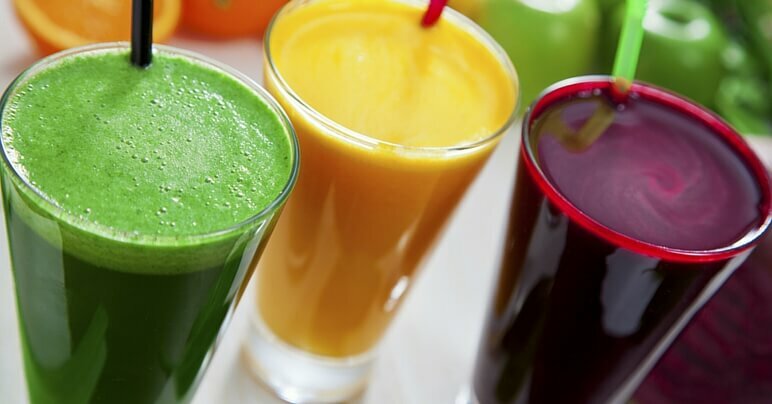 Doctors call fresh juices a 15-minute nutrient express to health! Most people don’t eat the recommended daily serving of vegetables. By throwing them into a juicer, you can easily eat more without even realizing it! Maybe you’re not the biggest green lover. If that’s the case, you can juice your nutrient-rich veggies along with fruit. This will help mask the taste and create an enjoyable drink! Fresh vegetables are alkaline foods. So by adding fresh vegetable juices to your diet, you will alkalize your body. This helps to boost energy levels and improve digestion. It also promotes clearer skin and overall better health. 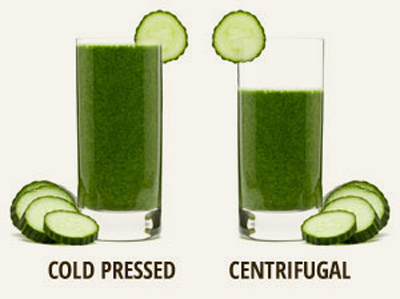 Looking at the side-by-side comparison, it’s clear that a cold-pressed juicer has more health benefits. First and foremost, it creates a higher-quality juice that preserves more nutrients. That is a big plus! Another benefit of cold-pressed juicers is that the juice lasts longer. According to Food Matters, fruit juices can last 24-48 hours and vegetable juices can last 12-24 hours (if they are stored properly in the refrigerator and in an airtight container). Also, studies show cold-pressed juicers can extract 35-50% more juice. So if you’re buying organic fruits and veggies (which are more expensive than conventional), then it’s great to know you’re getting more juice for your buck! Choose your fruits and vegetables carefully. You don’t want to buy an expensive juicer just to help you absorb more pesticide-laden produce. To avoid toxic pesticides and GMOs, go organic. Refer to the Dirty Dozen/ Clean Fifteen for a list of foods you should ALWAYS buy organic! Unless you are fasting or going on a doctor-approved juice cleanse, vegetable juices are not meal replacements. While some vegetables do contain protein, they don’t have enough to account for a full meal. Also, vegetable juice contains virtually no fats, which are key for overall health. This is a problem that affects millions of American adults and it isn’t something that exercise and diet alone can fix. In fact, if you suffer from this common problem no amount of exercise or healthy eating will do much to help you achieve the in shape, healthy body and life you crave. Specifically: poop trapped in your intestines and colon. If you suffer from low energy, weight gain, digestive issues, constipation, gas, bloating, indigestion, skin issues, fatigue or a laxative dependence, then you most definitely got a poop problem! You could have as much as 20 pounds worth of rotting food festering in your colon, pushing your stomach out by 3, 4 or even 6 inches, and robbing you of the health and vitality you deserve. It’s literally poisoning you from the inside! Over time, this toxic waste may leak into your body causing serious health concerns! This makes it impossible for you to feel your best and puts you at risk for obesity, diabetes, gut disease, food allergies, Crohn’s disease, Irritable Bowel Syndrome, leaky gut, heart problems, inflammation and much more. Look…I understand “poop” isn’t exactly a topic people want to talk about. But the health risks are simply too great for you to remain ignorant about this issue. They are NOT normal and should not be overlooked! What’s worse is the few who seek help get a 15-minute talk with their primary care doctor who writes it off as IBS and never looks deep enough to solve the underlying problem. Over time as we age, these issues grow into problems and open the door to over 170 serious health issues. Believe it or not, there is a VERY simple, one step solution to reverse the harmful affects of this toxic build up…and it takes just 30 seconds per day to take your health back! This short video presentation reveals WHY your body is burdened with pounds of poop and, most importantly, HOW you can flush that putrid waste from your system to achieve the health and weight loss you deserve. On the next page we will share with you exactly how to reverse these symptoms so you have more energy and vitality to do the things you love, lose the extra weight, end embarrassing digestive struggles, and feel like a younger healthier version of yourself. >>> Go to the Next Page!